This morning at approximately 10:00am, Arizona Time, I was handed a gift – access to Facebook Audience Insights and an wealth of information on each of our Quaintise client Facebook Page Audience demographics. While this feature is slowly being rolled out to most Facebook Admins, from what I’ve understood so far I am one of the lucky to have it so early. Facebook Audience Insights aims to give Admins greater access and, well, insight, into their demographic and Facebook audience. It is exactly as it says it is. Want to know the purchase habits of your Facebook Page Fans? How about the family size? Perhaps you’re interested to know how active your audience is on Facebook as a whole? Or what devices, mobile and desktop, your audience uses most frequently. 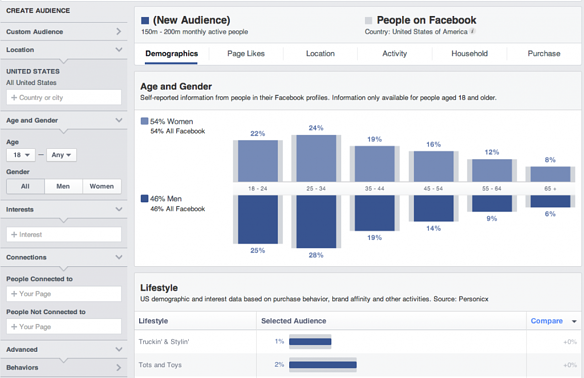 All of this, and more, can be discovered through Facebook Audience Insights. As a health care social media marketer, it’s important for me to understand our client’s audience. We need to have a keen appreciation for everything related to our client’s audience so that we can not only post appropriately to Facebook, but create entire social media and content marketing campaigns based on what we know about our audience’s interests. In the past, we’ve based our Facebook posts and campaigns on what our audience has shown us through engaging with our pages and responding to different topics. Many times it’s a trial and error process, until you become so adept at understanding the audience that posting relevant topics comes naturally. With Facebook Audience Insights, it’s much easier to see exactly what that audience is not only interested in, but what their behaviors show. This information is HUGE when it comes to creating relevant posts and entire campaigns, but also developing efficient advertising. One of the greatest aspects of Facebook Audience Insights is that you are not limited to just the Fans of your pages. You can run research on everyone on Facebook based on many details such as location, age, gender, interests, behaviors, language, relationship status, education, work, financial, home, market segments, parents, politics, life events and device owners. Wow, that sounds like a lot, and it is, but taken separately this kind of overwhelming information can offer Facebook Marketers amazing discernment into possible audience groups they might want to target. For example, here at Quaintise we take pride in the fact that our OBGYN marketing achievements are staller, thanks largely to social media efforts. Let’s say that we wanted to run some Facebook Advertising to increase the targeted Fans of a specific client here in Arizona. We want expectant mothers, to be exact. Expectant Parents on Facebook, as a whole, are mostly between the ages of 18 and 24, followed by 25 to 34 years of age. Of the Facebook Users who are Expectant Parents, 38% are Single while 36% are Married. 65% of Expectant Parents on Facebook are College Graduates. Expectant Parents are far more likely then the overall Facebook crowd to NOT use a desktop when on Facebook, but use a Mobile device, quite possible an iPhone or iPad. 30% of these Expectant Parents already have 1 child at home. Expectant Parents are more likely (then overall Facebook Users) to purchase products online. And, as expectant, this demographic is far more likely to be in the market for a Crossover vehicle, Hybrid vehicle and/or Luxury SUV. This is just the beginning of what can be accomplished with Facebook Audience Insights. The information and Big Data that can be gathered, especially that information dealing with the health care industry, is limitless.